The latest update for GTA V, brought many new features to the game, with new missions and heists for GTA Online, as well as graphics options and other interesting enhancements. Although it appears that some are not too pleased. Many players are experiencing horrible bugs in both the single player and online modes of the game. Many have reported that the GTA V keeps resetting their setting options on each startup, something that those who dedicated some time adjusting the controls for the first-person mode is a bit cumbersome. No solution to the issue has been found yet. Another issue is that the cars seem to be almost indestructible, taking minimal damage. This issue affects both single player and online modes. Another little issue is the ‘press X to duck’ message that appears every time you enter a vehicle, which seems to remain on until you abandon said vehicle. The last issue is the state of the game’s online servers, which since the update have been extremely hard to get into. It’s disappointing that fans after such a big wait for GTA V Online Heists, to not be able to enjoy the highly anticipated features. We can hope that these issues are addressed as soon as possible and that players get to enjoy all that GTA V Online Heists has to offer. We will bring any new information on GTA V as it becomes available. Heists are a new type of gameplay experience inside GTA Online – massive, multi-layered, 4-player co-operative missions that encourage players to work together and make the most of their individual strengths, and a team’s level of communication and coordination can make or break each mission. Heists unlock at Rank 12 for players with a high-end apartment. They are started by a call from Lester and a visit to his garment factory. Please note there is a short delay between each Heist, but Lester will be in touch when the next Heist is ready. You can replay Heist strands by calling Lester using the “Request Heist” option. Players who are rank 12 or above and own a high-end apartment will receive a phone call from Lester. When a player accepts Lester’s call and begins the Heist, they become the Heist leader and can choose to invite other players from the lobby, their friends list, or players from the previous Heist. 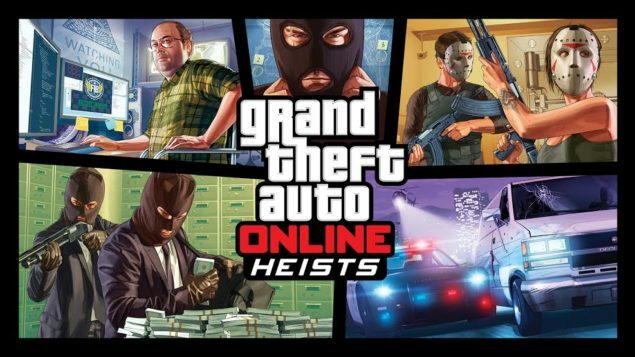 Players of any rank who have already completed the GTA Online tutorial up to and including Gerald’s first LTS job can play Heists by accepting an invitation from a Heist leader. The Heist leader has the responsibility of fronting the setup costs to acquire whatever equipment and additional NPC personnel needed to pull off the job – which amounts to a percentage of the final pay-out. Members earn money for completing each setup mission. Heist leaders do not earn any money for completing a setup mission, though they do earn 10% more RP than other members. Leaders can assign themselves a larger portion of the take once the entire Heist is complete. Successfully completing a setup missions drops players back into Freemode. The Heist leader can then use their phone to return to the Heist planning board and start the next job in the strand. Completing each Heist Finale for the first time. Completing all the Heists as a member. Completing all 5 Heists in order. Completing all the Heists back to back with the same team. Completing all Heists on Hard difficulty, with the same team, in order, and without anyone dying. On PS4 and Xbox One only: completing all Heists in first person view. Note: The Heist leader must lock the game to first person in the lobby to unlock this. 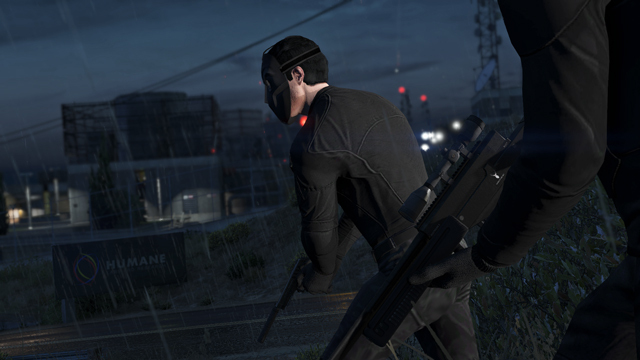 Heists are available for replay after completing each full strand as Heist leader. Players can do this by calling Lester and requesting a Heist. There is a short delay before you can replay the same Heist again as Leader. Heists are available for players to join as crew members without delay as long as there is a Leader with an active lobby to join. The Heist replay board becomes available at your high end apartment once you have completed all 5 Heist finales as Leader or crew member (but you must also have reached rank 12 and visited Lester to access it). In Siege Mentality, one to three players are placed in a tower and are tasked to survive for 4 minutes. They can’t leave the tower but they have full use of all weapons. Attackers are tasked with taking out the tower players and have unlimited lives but only use sawn-off shotguns. Hasta La Vista is based on an action classic: The Runners are attempting to reach a checkpoint on bicycles whilst being chased by the Attackers in trucks. No weapons are included in this versus mode; the Attackers in the trucks must rely solely on crushing the Runners. If one of the Runners reaches the checkpoint, they win. The Attackers must take out all of the Runners to win. In Come Out to Play, a team of Runners attempt to survive a run on foot to an escape point while being pursued by Hunters riding bikes (or ATV’s). The Hunters must stay on their bikes and are limited to using sawn-off shotguns, but have infinite lives. The Runners only have one life each, but all their weapons to defend themselves with. Daily Objectives have been added to GTA Online, unlocking at Rank 15. Players will receive Cash and RP rewards for completing all 3 given objectives each day. An additional large cash and RP bonus can be earned for completing all daily objectives for 7 days straight, and then an even bigger award for completing them 28 days straight. New Free Roam Activities have been added to GTA Online. These unlock at Rank 15. 40 new Awards (including one first person reward for PS4 and Xbox One only) have been added. These awards are for a variety of existing and newly added content, some of which are accompanied by large cash rewards, t-shirt unlocks, or vehicle modification price reductions. 9 new Heist Achievements / Trophies have been added to GTA Online. New vehicles have been added to the in-game vehicle websites and are immediately available for purchase. 11 existing vehicles have also been added to the various in-game websites for purchase. New vehicles will also unlock for purchase as players complete Heist missions. Players can now buy and save up to 30 personalised licence plates for their stored GTA Online vehicles via the iFruit App. There are now 2 pages of jobs down from 3. The first page will display only Jobs of the same type you just finished playing, including a “Random” option. For example, if you just finished playing Rooftop Rumble, only Missions will appear on the new first page, and you will have a “Random Mission” option. The second page will show a random selection of jobs, similar to how the Next Job Voting Screen works now, to allow players to change Job types if desired. Quick Jobs will now place the player On Call. Players who choose to join Jobs using the phone’s Quick Job function will now be shown which Job they will be joining. Players who are not the Host are now able to send Job invites when in a lobby for a Job, so long as the Host sets the Client Invites option to Open (visible on the Matchmaking screen when in a lobby). Please note that only Hosts can invite to Head to Head and Challenge Playlists. A new invite option has need added – “From Last Heist”. This option allows players to invite all players from a previous Heist in the session. This will only appear if there are players to invite. Join Job has been renamed to Quick Job. Host Job has been renamed to Play Job. Pointing animations have been added to allow players to give basic directions if they do not have microphones. Saved Outfits – players can now save up to 10 of their own Outfits when browsing clothing at the clothes store. Players can access their saved Outfits at the Outfit counter in a clothes store, from the wardrobe in their apartment, or through the Interaction menu. They can also wear these saved outfits when ‘Player Owned’ is selected as the clothing option in a Heist or Adversary Mode corona. A new UI and color scheme has been added for player phones to allow Heist related activities and invites to stand out. All Heist related invites are green. New functionality has been added to allow players to Email each other across sessions. This can be accessed via the Eyefind.info homepage when using the in-game internet. All new Adversary Modes can be joined as Quick Jobs via the in-game phone. Apartments with an active Heist waiting to be started are blipped green and flash to notify players that a Heist is available. Players who use Mercenaries to kill other players in Deathmatches will now be awarded a kill should the Mercenaries kill the targeted player. Players can choose which of their Personal Vehicles to take on a Heist while on the Outfit selection screen. Lester Kill Targets now appear as an option for Quick GPS on the Interaction menu. Players are now able to purchase armor and ammo refills from the Leaderboard for Missions. Players who leave a Job will now have this made clear on the Leaderboard after a Job has finished. Players will now no longer receive Mission reminder phone calls if they have been in a session for less than 15 minutes. Players are now able to bring up their phones during Parachuting Jobs to quit out. Destroyed vehicles with no insurance will now be displayed as “scrapped” in mechanic and garage menus. The Homing Launcher has been rebalanced to have increased reload times, reduced firing rate, and an increase to the resilience of large capacity planes against it. “Request Heist” has been added to Lester’s Contact Menu. This will only show Heists that have already been completed, as well as only showing if one is available. Players can play a random Heist Setup or Finale as a Heist Crew Member via Quick Job. They are able to join an open Heist lobby directly or wait for the Heist to fill up while On Call. A new blip has been added for vehicles with Turrets. Fixed an issue where players could receive error messages and being requested to re-complete the tutorial when attempting to join friends. Fixed an issue where choosing different fuel tanks on the Bagger could cause the rear brake light to disappear. Fixed an issue where players could become stuck in an unexpected camera view after completing a Parachuting Job. Fixed an issue where players could become stuck on a black screen if they constantly changed TV channels. Fixed an issue where the screen could flash when moving back to GTA Online after leaving a Next Job Voting Screen. Fixed an issue where the same vehicle could show as hardtop and convertible to different players. Fixed an issue where a player’s mental state could increase during a test run of a UGC GTA Race. Fixed an issue where it was possible to become stuck when accepting an invite to a Contact Mission. Fixed a small text issue in an Alert message when an apartment owner requested all players leave their apartment. This text does not show to the apartment owner. Fixed an issue on the Weapons page (Pause > Stats > Weapons) where incorrect weapon descriptions could show if the pages were scrolled through too quickly. Fixed an issue where incorrect messages about Survivals not being available could show in Solo Sessions. Fixed an issue where it was possible to hang / become stuck on a black screen when entering the cinema. Fixed an issue where players were unable to access Gamer Cards on the Playlist Leaderboard screen. Fixed an issue where players could become stuck if their opponent quit out of a 2 player Deathmatch. Fixed an issue where a button prompt for filtering Deathmatches in the Online Job menu stayed on screen when it shouldn’t have. Fixed an issue where it was possible for incorrect ticker messages to show after committing suicide when winning in a Deathmatch. Fixed various issues with entering and leaving garages and apartments. Fixed an issue where it was possible on rare occasions for players to lose items after spectating other players. Fixed an issue where the Riot Van would continually spawn at the Impound Lot. Fixed an issue where players would remove / un-equip their Flight Cap while using a vending machine in Ammu-Nation. Fixed a small clipping issue with telescopes if players wearing masks used them. Fixed a number of issues regarding the Crew Emblem disappearing and/or reappearing after repairing in a Mod Shop or respawning during a Race. Fixed an issue where a player could be left in random places on the map if they rebooted whilst in the Flight School corona. Fixed an issue where Sea Races could not be created due to incorrect vehicles being available and the inability to place the starting grid. Fixed an issue where players spectating a LTS match will not be able to hear any ambient music. Fixed an issue where the “Publish” menu option is greyed out until player begins moving selection cursor in Capture Creator menu. Fixed an issue where players were unable to enter the “Add Your Job” list during Playlist creation. Fixed an issue where players could occasionally be unable to join or Host a Job or Mission lobby and would receive the Alert message “The job failed to download because it contains invalid data and needs to be remade”. Fixed an issue where players could become stuck if they challenged another player to a one on one Deathmatch then hosted a Job. Fixed an issue where the minimap did not turn to match player orientation when the gunner camera was being used. Fixed an issue where some Rockstar Created Missions had gone missing from the Online Pause menu. Fixed an issue where incorrect amounts could be awarded after winning a bet on a GTA Race. Fixed an issue where Passive Mode would become disabled when exiting vehicles. Fixed an issue where players could spawn into their garages and become stuck there. Fixed an issue where players were unable to lose the Bounty blip after being killed and having the Bounty on them collected. Fixed an issue where some hairstyles were missing from the Barbershop menus. Fixed an issue where it was possible to lose control of your character when walking into Tear Gas. Fixed an issue where Armored Trucks could spawn with their back doors open and wouldn’t pay out when attacked. Fixed an issue where hats and glasses would occasionally not update correctly when being browsed in clothes stores. Fixed an issue where players were able to wear a Mask and a Bulletproof Helmet at the same time. Fixed an issue where full teams were not showing on the Celebration Screen after winning a Versus Mission. Fixed an issue where players would occasionally not enter their properties smoothly. Fixed an issue where choosing to use the D-pad down option to bring up the minimap would cause a brief freeze when the map appeared. Fixed an issue where Player lists would not update to show dead players in LTS matches. Fixed an issue where checkpoints would not turn red during a freefall section of a Parachuting Race. Fixed an issue where picking up a Parachute during a UGC GTA Race could cause players to lose control of their characters. Fixed an issue where players may end up alone on their own Leaderboards in between Playlist rounds. Fixed an issue where other players could become invisible to you only after being buzzed into an apartment. Fixed an issue where players could spawn back into GTA Online with their last equipped weapon still in their hands. Fixed an issue where the water being turned off in the shower did not sync correctly with the audio. Fixed an issue where players were able to receive phone calls when exiting their apartments. Fixed an issue where players would not always be spawned in a vehicle after starting a One on One Vehicle Deathmatch. Fixed an issue that caused players to hover above a seat if spawning in an Apartment. Fixed an issue where if a player was killed in a Helicopter Race then quit out, they could become stuck. Fixed an issue where players in Passive Mode could be killed using the hose on the Fire Truck. Fixed an issue where players could start Parachuting Races facing the wrong way. Fixed an issue where Drivers in a Rally Race would only see their Co-Driver gain any winnings from Betting if they won the Race. Fixed an issue where players could gain a Wanted Level during a One-On-One Deathmatch. Fixed an issue where the Leader’s score would not show to any player in a Parachuting Race. Fixed an issue where there would be no spectator view after completing a Race. Fixed some small issues where vehicles had the incorrect manufacturer’s name on entering Mod Shops. Fixed an issue where passive mode would not show players as properly transparent. Fixed an issue where players were unable to use buzzers on an Apartment Building if they already owned an Apartment in the same building. Fixed an issue where it was possible to trigger a Job, despite a corona not being visible in-game. Fixed an issue where it was possible to become stuck at the start of the Rockstar Verified Race ‘Panto-monium Microcircuit’. Fixed an issue where Featured Crew Posts would not show up on Crew Member profile feeds on PS4 and Xbox One. Fixed an issue where player characters could lose their hair or have the wrong hair color and style after migrating. Fixed an issue where it was possible for NPC’s to appear sitting on the toilet in player apartments. Fixed an issue where players were able to get Muggers inside their garages. Fixed an issue where Armored Trucks would not award RP to players who attacked and opened them. Fixed an issue where players were unable to remove Crew Emblems from the Dinka and Jester Race Cars. Fixed an issue where the Pogo mask was not available for purchase. Fixed an issue where in-game cartoons would not work when being viewed over the internet on phones. The “Neon Lights” option has been removed for Dune Buggies and was not intended to be available for that vehicle.